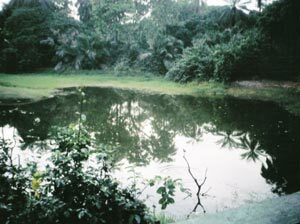 Abuko – The Gambia's first reserve and a place that must be visited on any trip to the country. It's an area of pools and primary forest, and is the place to see many forest species. This was the first of two visits we were to make. We had high hopes when we arrived and we weren't disappointed. Within minutes we had seen African Jacana, Striated, Black-headed and Squacco Herons, two Violet Turacos (quite superb in flight), Hamerkops and Palmnut Vultures. Also at tha main pool we had both Pied and Giant Kingfishers. We began to walk the trails and soon heard an interesting call note. Peering into the dense tangle of bushes and trees we managed to see an adult and juvenile Snowy-crowned Robin-chat. One forest speciality got – a few more to go yet. The next forest bird was Little Greenbul, often heard, not often seen and not too exciting when they eventually are seen. We heard then tracked down Common Wattle-eye and then Black-necked Weaver plus a more-easily-seen Grey-backed Camaroptera. More Red-bellied Paradise Flycatchers were found followed by our first Blackcap Babblers feeding in the leaf litter. Grey Plantain-eaters and Red-billed Hornbills could be heard almost everywhere but usually stayed up in the canopy. In a more open area we had, in quick succession, two more sought-after forest species: Green Hylia and Yellow-breasted Apalis. Again both heard before being seen. Back in the wooded depths a bit further on we came across a group of four African Paradise Flycatchers, one male had a splendid tail – all showed very well and didn't seem bothered by our presence as they moved past busily feeding. Then we were back in a more open area which held Swallow-tailed Bee-eaters and Splendid Sunbirds. Finally, for this visit to Abuko, some of us dropped by the photographic hide and, after a short wait, were rewarded with, in addition to the usual Red-eyed Doves and Bronze Manakins, both Lavender and Orange-cheeked Waxbills and Blue-spotted Wood-dove, followed by a female Northern Puffback. Our second visit to Abuko was later he same day. We began at the opposite end of the reserve to where we started this morning and soon heard Green Turacos making quite a racket. We tracked down the noise and had a pair showing very well, and then a single joined them. Another peek from the photo hide and we saw another Green Turaco coming to drink followed by a right cracker of a bird: a Western Bluebill. Our path this evening was almost the reverse of the route we had taken this morning. We had another Snowy-crowned Robin-chat (different site). more Black-necked Weavers and Little Greenbuls, Fork-tailed Drongo and African Thrush. An open area had us gasping at the beauty of a male Scarlet-chested Sunbird flashing his iridescence in the evening sun followed by a brace of cuckoos: first a female African Emerald Cuckoo then a male Klaas's Cuckoo. A stationary Fanti Saw-wing gained our attention as did two loud Senegal Parrots shooting overhead. There was more to come in this area: African Golden Orioles and, flying to roost, Black-crowned Night-herons and Great Egrets. A glance backwards to see where the others were and I saw something new. I called Solomon over and said 'there's a Pied Hornbill up there'. I am pleased to say that it stayed put and all saw it well. Finally a couple of us had a brief view of a Grey-headed Bristlebill, another notoriously skulking forest species. Our third and final visit to Abuko was near the end of our stay in the Gambia. The main pool held Giant Kingfisher, Grey and Black-headed Heron and Black-crowned Night-heron. From a hide giving a different angle on the pool we found, hiding in shrubbery, a juvenile Little Bittern, a bird Solomon hadn't seen in Abuko for about ten years! He was, admittedly, slightly skeptical but Paul had video evidence and the one-man rarity committee accepted it! Time for another primary-forest walk. Common Wattle-eye, African Thrush and Little Greenbul were seen along with a lot of Black-necked Weavers. A Grey-headed Bristlebill showed really well. Vaughan said it was the best views he'd ever had – well, it did come to about six feet away! We could even see the bristles. Very soon after this bird Pete B said he had a woodpecker. I feel Solomon and Vaughan both knew what this was straight away as they rushed to his side and failed to see the bird which had moved. Fortunately it was soon relocated and we all had plenty of opportunity to watch a well-behaved Buff-spotted Woodpecker – yes we could see the buff spots too! This is a good bird to get. Abuko is about the only place to find it and it normally stays high in the canopy. Red-bellied Paradise Flycatcher was again seen as was Western Grey Plantain-eater, Blue-spotted Wood-dove and Green Turaco. Our heard-only list comprised Ahanta Francolin and Yellow-breasted Apalis but we again had good views of Green Hylia. I checked out a couple of sunbirds and informed the gang that there was a pair of Collared Sunbirds just above their heads. That made sunbird species number eight! Later that day we dropped by Abuko again on the way back to the hotel. The main pool held, as well as the usual stuff, a pair of Giant Kingfishers and an African Pygmy Kingfisher. Some went to see if they could track down the Ahanta Francolins (only Solomon and Al saw one) whilst Helen, Pete B and I stayed by the main pool in the hope of a White-backed Night-heron. Alas, the bird did not show. We did get Black-shouldered Kite and five Mosque Swallows on the drive back though.